...and it happens every Spring. After Easter I always go to my nature/bird/nesting theme. I thought I wanted just a plain (gee, that's not a word that I use often) and simple sideboard vignette, but I should have known that once I had things in place that I'd be looking for something else to slap up here for more visual interest. These little sweeties are cut from an old torn up bird book and mod podged onto an old dictionary page. Then framed in an antique photo album page. Click here to see the original post I did on them. for some shiny hallway fun? yuck. that I brought in from the Dining Room buffet. time to mix things up. So here's the Hallway Sideboard... for awhile anyway. You never know what you'll find in here. I'm joining in with all of you, sending our love and prayers for Boston, and for those whose lives are forever changed by the tragic event at the Marathon. Elegantly displayed vignette on your sideboard, dear friend!!! Of course, the Meadowlarks and the Sunflowers stole this Kansas Lady heart!!! I combine my prayers, with yours,for the victims of the Boston Marathon. Debra -That chalkboard is so pretty. Love the curvy shape. That is a beautiful vignette for this time of the year. Love the "bird" theme you have going. I like the bird themed vignette, Debra. Still loving the chalkboard too! Just lovely Debra! Can't help but love all the birds. So cheery! Happy Spring! And yes, thoughts and prayers to those victims of the Boston tragedy. Beautiful Debra! I love your chalkboard, so pretty with all your birds! Fresh and lovely Debra! Just what is called for in April. From one bird lover to another...adore this! Love those, Debra! Beautiful bird prints! I always love seeing your birds, Debra. The board makes a beautiful backdrop. I'm praying for Boston too. It's heartbreaking. I like the bird prints and don't think they make this scene look busy. They complete the look. 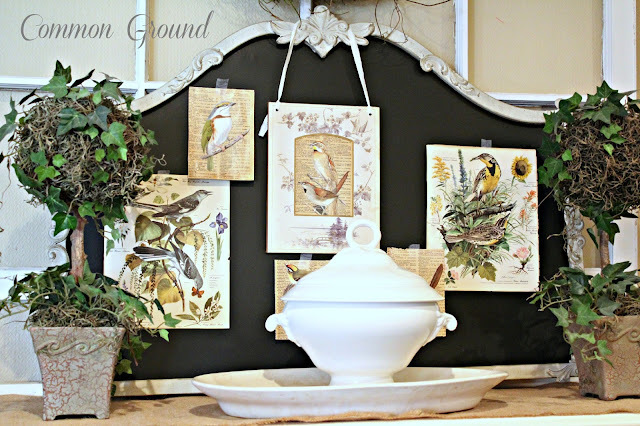 Just adore your display~ so sweet and charming and perfect for Spring! Just lovely! I am a sucker for anything birds, and throw in the vintage aspect and you got my heart pumping. I am liking that P1 piece. Makes for a perfect backdrop. Such a pretty vignette on your sideboard, Debra. I love birds so I love your theme. I really like the mod podged birds on the dictionary page...very sweet! And that is the neatest chalkboard I've ever seen, I wouldn't expect something like that from Pier 1. I wish I had some wall space for one! Debra, if you sold these on etsy I would buy them all. I think they are absolutely gorgeous!!! I love that you put then on old book pages etc. I'm so glad you posted this, I missed the post showing how you made then. They are just darling on your sideboard! you've created some pretty paper charms, debra:) they look great on your awesome chalkboard, too! Lovely. I never get tired of drawings of birds. Mixed in your greenery and its perfect. You know how I love birdies. 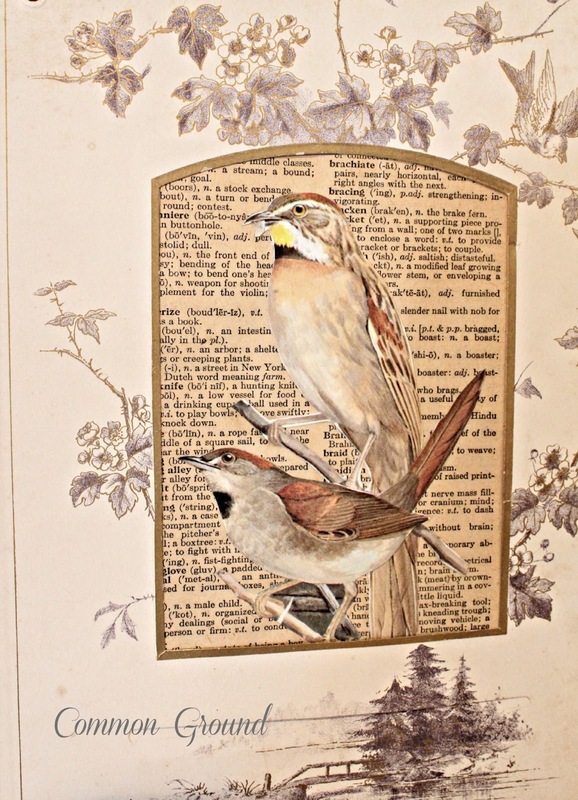 I love your bird theme and the "bird paper dolls" are perfect on their dictionary pages. Such a lovely arrangement... tugs at my heart strings. My own home, Muse Cottage, is all about celebrating birds...now I am eager to find such lovely prints and play paper birds as well! Love the chalkboard...it is so pretty!! 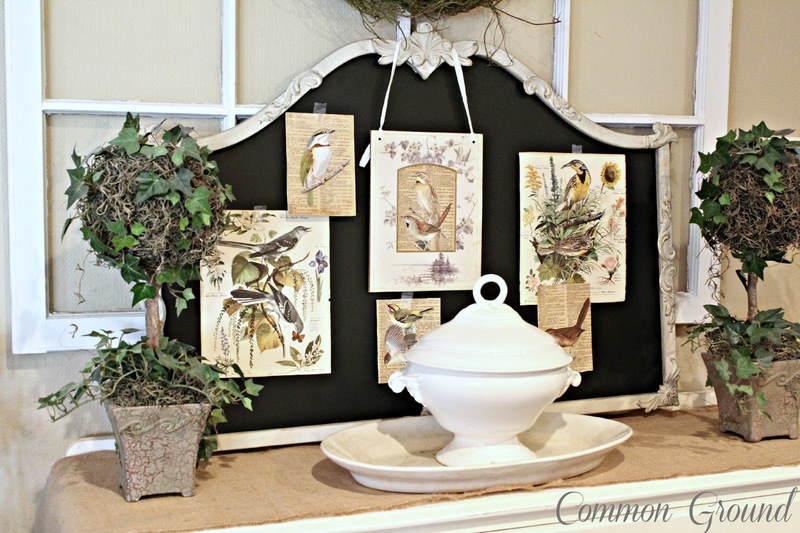 What a beautiful bird vignette for Spring time!! Such a unique Springtime update. It's so sweet! 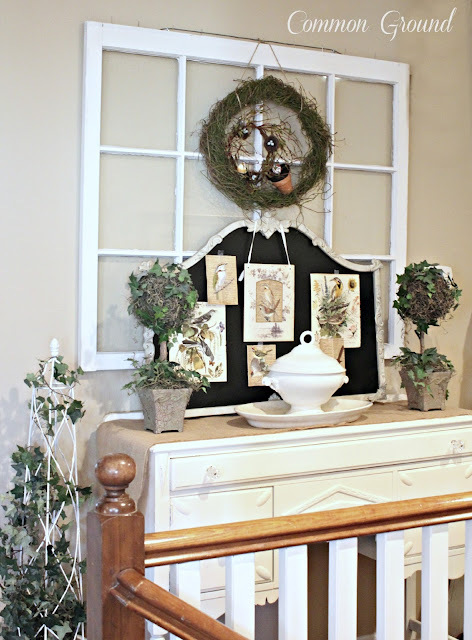 What a beautiful vignette, Debra! I love birds too. Your sweet little birdie on a book page is just darling. And I am drooling over your chalkboard!! Your display is gorgeous!! I would love for you to link up at my craft party! Just follow the link....http://sew-licious.blogspot.com/2013/04/saturday-show-licious-craft-showcase-27.html. The bird prints on the chalkboard are so beautiful! Love the whole vignette. Debra, Your sideboard looks so pretty. I'm loving the chalkboard and love how you're showing off your birds. 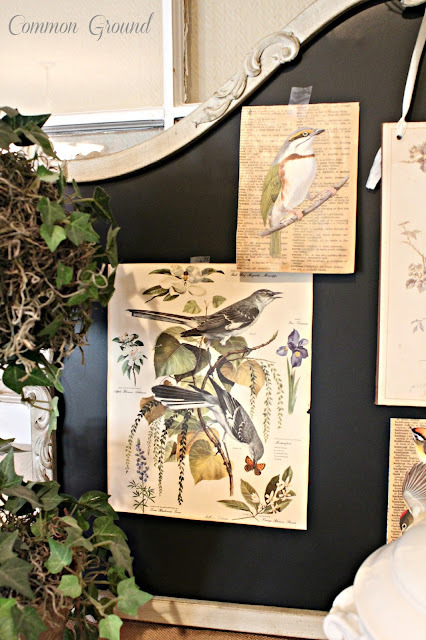 Love how you displayed all those gorgeous birds - so fresh and pretty! I am coveting that chalkboard! Perfect...everything about this shot is just perfect. 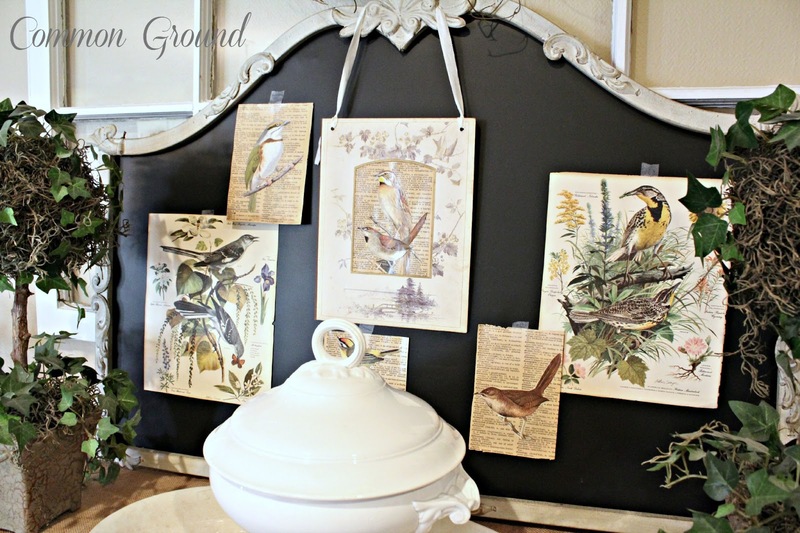 Love tureens, love birds, love vintage, love chalkboards. You have got it all. Love this Debra...I think it's one of my favorite vignettes you've put together! Thank you for thinking of us here in Boston...it's even crazier this morning! Just happy my family is all safe and sound! It all looks very pretty Debra! Have you tried that new tape everyone is using? Cannot think what it is called. But I bought some, very reasonable in price from the scrap booking area. Looks really neat when you hang up the unframed pictures. Something new to play with. 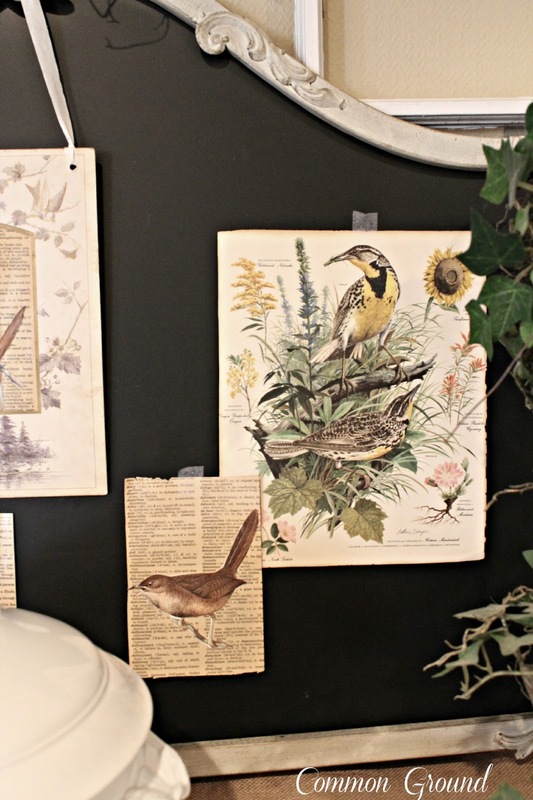 Love using bird images especially vintage ones when I'm working on a project. Oh...I love the way your chalkboard looks. I have still to see this in person. It said we had one come in on truck but I never saw it. It looks great with your bird prints. I hope your husband does well today and gets on the road to recovery soon. He must be so frustrated with how things have gone the last two years. I'll be thinking of you today. 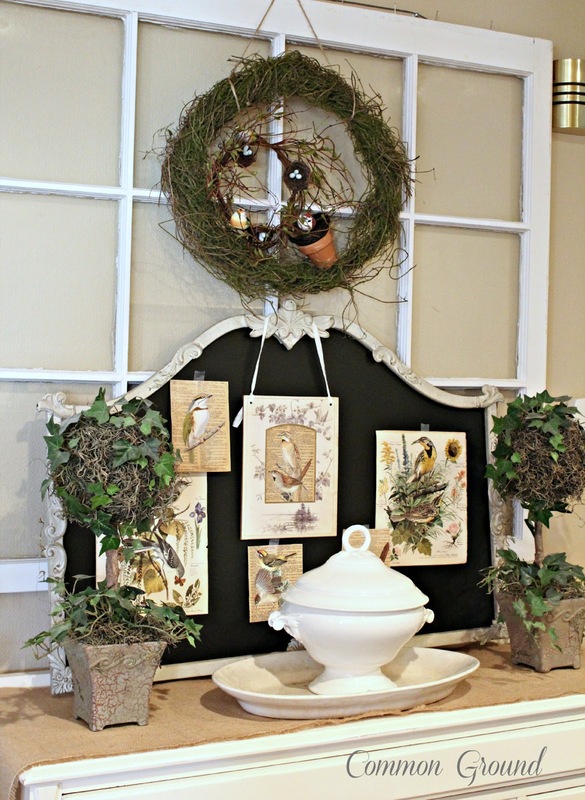 Beautiful vignette, Debra! I am loving your chalkboard and the cute bird prints. Take a look at this weeks Open House party to see your feature. Hi Debra, I too pull out my bird and nature decor after Easter. One of my favs. Love, love your old bird pages. Great vignette. But I wouldn't expect anything less from you. Thanks for sharing it with SYC. This is so pretty Debra. I love the tureen and platter as well as the birds. Great look.